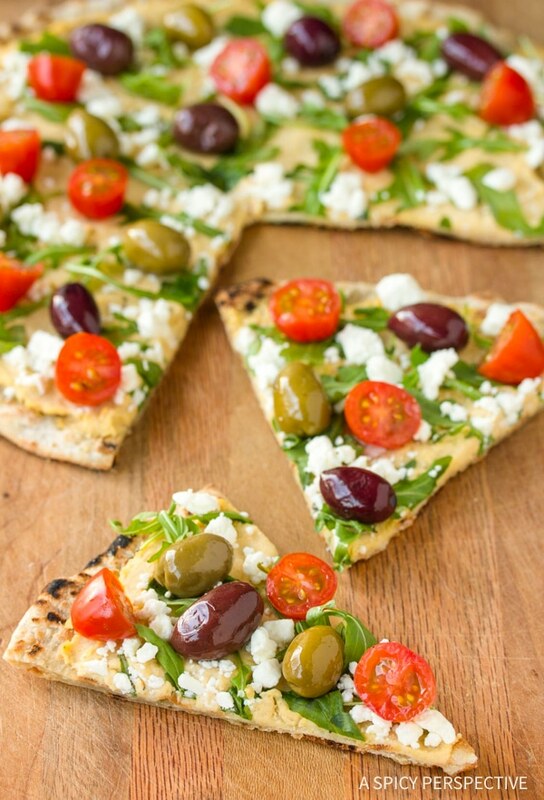 Grilled Greek Pizza, A light and healthy mediterranean style pizza cooked on the grill! There are only a few things in life I love more than the smell of yeasty dough bubbling up while baking. The aroma floods my mind with countless memories, comforting and warm. Memories of mom’s homemade bread from a live yeast starter. Memories of tender buttery yeast rolls, as soft as clouds. Memories of clumsily learning to make pizza from scratch as a newlywed. We tend to associate dough with heavy calorie-laden meals. Yet today’s Grilled Greek Pizza is lean-and-mean with fresh raw veggies and just a sprinkling of feta cheese. I love grilled pizza in any form, but Grilled Greek Pizza is at the top of my list this summer. Loaded with creamy hummus, arugula, fresh garden tomatoes, briny olives, a touch of feta, and a drizzle of good olive oil, I’m going Greek any chance I get! The foundation of any good grilled pizza is the dough. I make a simple dough, with just 6 ingredients: yeast, water, sugar, bread flour, olive oil and sea salt. The most important thing to remember about making quality pizza dough is use good quality ingredients. Make sure your yeast hasn’t been sitting around too long, and use the best olive oil and sea salt you can get your hands on. Although homemade pizza dough is amazing, if you’re in a hurry you can buy pizza dough in the freezer section, or sometimes the deli section of your grocery store. Grill the pizza dough on hot grilling stones then load with hummus and fresh ingredients. 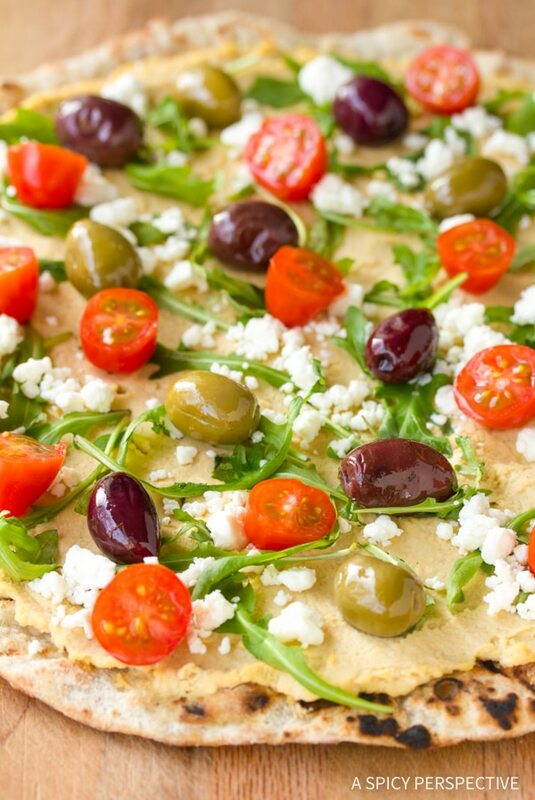 Drizzle the top of the Grilled Greek Pizza with olive oil to bring out the flavors. 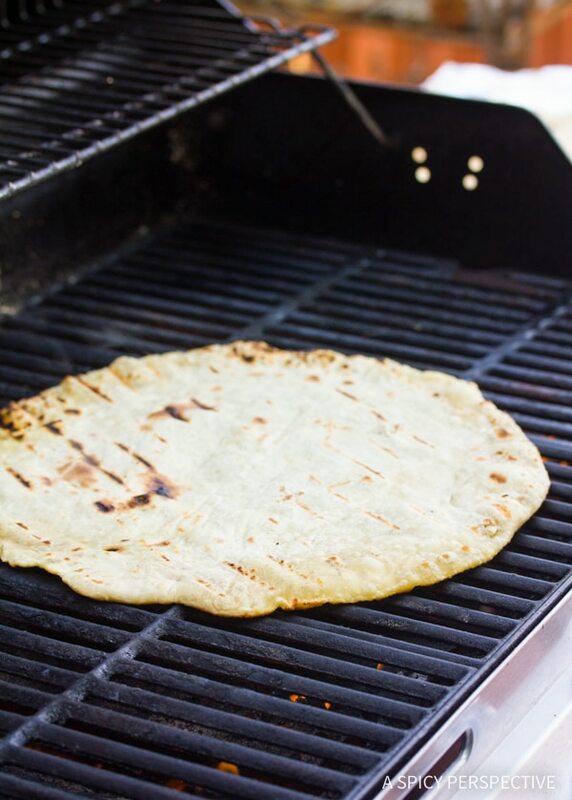 If you don’t have a grilling stone, you can use a baking stone or just throw the pizza dough right on the grill grates. It’s just a little harder to flip over when on the grates. This easy Grilled Greek Pizza is loaded with fresh ingredients and cooks up in minutes. 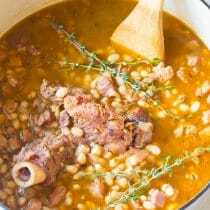 It’s a fabulous mid-week meal that can hold it’s own on the weekend. 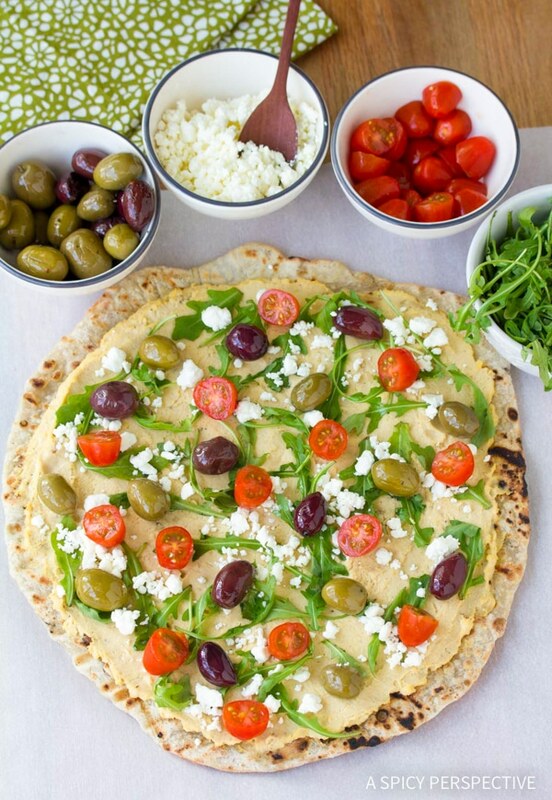 Grilled Pizza layered with hummus, fresh veggies, olives and feta. Cut the dough in half. Then using a well-floured rolling pin, roll each piece of dough out into 12-inch circles. Place the dough circles on parchment paper. Lightly oil the tops and let them rest while the grill is heating. Preheat the grill to high. If you have a grilling/baking stone, place it on the grill. Meanwhile prepare the pizza toppings. One at a time, flip the dough circles onto the grill stone or grates. Grill for 2-3 minutes per side, flipping carefully with a large spatula. 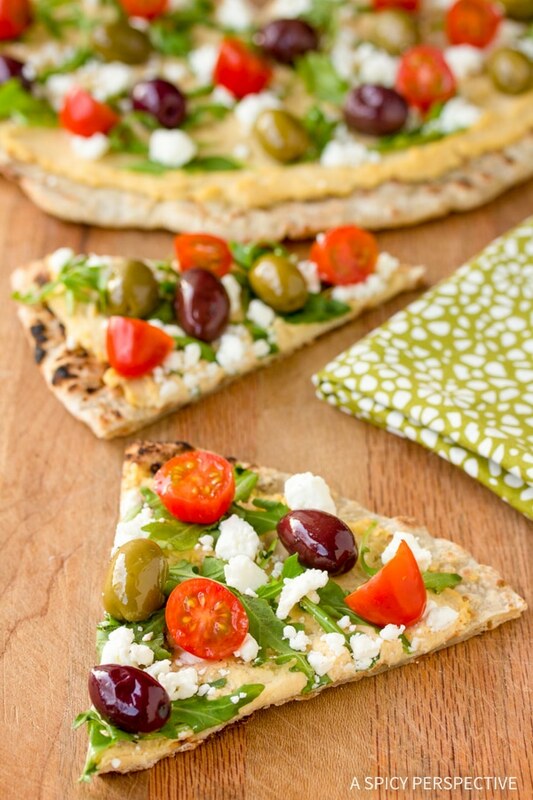 One both pizza crusts are grilled, spread 8 ounces of hummus on each crust. Then top both with fresh arugula, tomatoes, olives, feta and drizzle with a little olive oil. Serve warm. Your pizza looks yummy! I so want this stone. I love putting tons of veggies on my pizza. Asparagus, prosciutto and sage with a white bechamel sauce. Yummm! i think your pizza looks amazing … but my fave is with pesto and veggies. mmmmm!! Oh I’d put goat cheese, olive oil, prosciutto, marinated artichokes and definitely chilies! follow Spicy Perspective on twitter. I love 4 cheese pizza and anything Thai flavored. Just found your site from a tastespotting link. I love lots of toppings – sausage, pepperoni, mushrooms (fresh), onions, green peppers, tomatoes, and tons of cheese. I like to put thinly sliced grilled chicken on grilled pizza! Brussel sprouts and a barely cooked egg, yum! I love pizza simply with fresh tomatoes, basil, and fresh mozzarella. I follow A Spicy Perspective on FB and Twitter! Tomatoes, chicken, basil and red peppers! 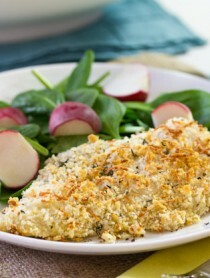 I love chicken with dollups of ricotta cheese…at least I used to in coolege after we would hit the bars! so long ago….! I’m following BigKitchen on Twitter! I love putting onion, garlic, and fresh jalapeno on my pepperoni pizza! I love artichokes and fresh summer veggies on my grilled pizza. shared this link on facebook! my grilled pizza would include white alfredo sauce, chicken, and basil! delicious! i subscribe to a spicy perspective via email! Another good option we enjoy is deconstructed ratatouille (minus the onion): sliced eggplant, sliced zucchini, sliced tomatoes, fines herbes, olives and plenty of olive oil. I have had rave reviews with grilled eggplant, add tomatoes, olives, and a small helping of mozzarella, sprinkled with parmesan. When it comes to pizza, my family is traditional: we like tomato sauce as a base– (only a little bit, otherwise it gets soggy) — I’ll have to try the hummus! Great idea — and it’s not as liquid and runny as tomato, so I suspect it will be family favorite. My favorite toppings are grilled veggies, with generous drizzle of olive oil, and spices: basil, oregano. I look forward to making grilled pizza on this Emile Henry Grilling and Baking Stone! I pinned this post – so excited to make it! 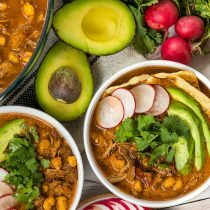 I followed Big Kitchen on Twitter! Followed Big Kitchen on Facebook. I get email and RSS feed updates for A Spicy Perspective. First I love the idea of cooking the pizza and using it as a salad base. Second I would put arugula, goat cheese and tart apples or roasted beets. Fresh basil, tomatoes, ball mozzarella, mushrooms, and chicken with either red or white sauce. I would try to replicate this pizza I had in Boston: Pulled Chicken goat cheese fondue, chimichurri sauce, grilled corn, roasted summer vegetables. I love Greek style everything…a couple of days ago I had an excellent Greek salad that totally hit the spot and left me with an ear to ear grin…super simple, refreshing and tasty! Your pizza looks awesome. Love the plate you cooked it on, this looks like tons of fun! Bet that thing is great for cooking up pancakes too! I Follow BigKitchen on Twitter. I Follow BigKitchen on Facebook. I would put tomato sauce, mozzarella cheese, garlic, goat cheese, italian sausage, sweet peppers and fresh oregano. Because my garden is so fruitful, mine will ge a grilled garden pizza with lots os tomatoes,, zucchini, onions, basil and greens! I follow @bigkitchen on twitter. I fOllie a spicy perspective on twitter. This is a great giveaway! I’d love to try both my first grilled pizza& first white pizza. I’ve been thinking of trying one with ricotta & mushrooms then maybe arugula dressed with olive oil & lemon juice on top. I’ve been making traditional pizzas with red sauce & Italian sausage or meatballs which my kids have always loved but my husband & I are ready to branch out. I love to put grilled tomatoes, basil, and mozzarella on a grilled pizza. MMMM! I like to put fresh tomatoes and herbs from the garden. I’ll be trying your dough recipe since I’m still looking for the “perfect” one. 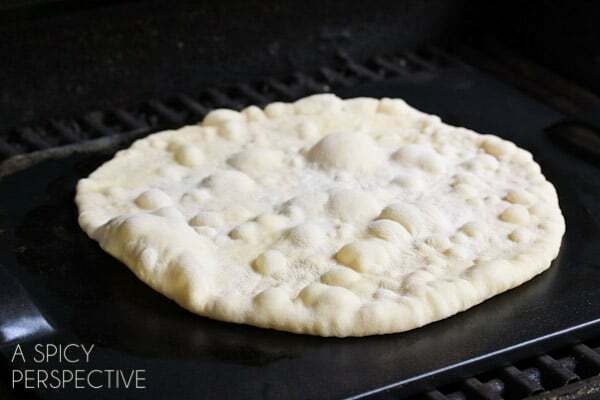 Your picture reminds me of a pita bread dough I’ve made. Looks delicious! I love my grilled pizza with grilled spicy sausage and pickles jalapenos!!! Mmmm I like goats cheese, sundried tomatoes, kalamata olives, spinach, and onions! And I already like Big Kitchen on Facebook and on Twitter! I already follow you just about everywhere on the planet! I’m madly in love with fig anything on my pizza lately, but that grilled crust looks good enough to eat all by itself! What an awesome pizza! I love all these fresh flavors! As for my own pizza, I’d love to try a chicken enchilada version. This looks fabulous!! I actually have my own greek grilled pizza. It’s pretty simple. I just throw a greek salad on top of the dough after I grill it up! It’s my favorite pizza ever! I pined the product on Pinterest. Mmmmmm, pesto, cheese, roasted red peppers, onion…..YUM!!!!! Wow! I might actually be able to grill a pizza with this stone. My pizza of choice would be margarita. 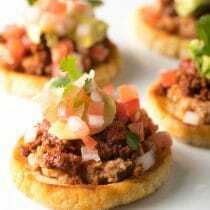 Sommer – love this healthy pizza! 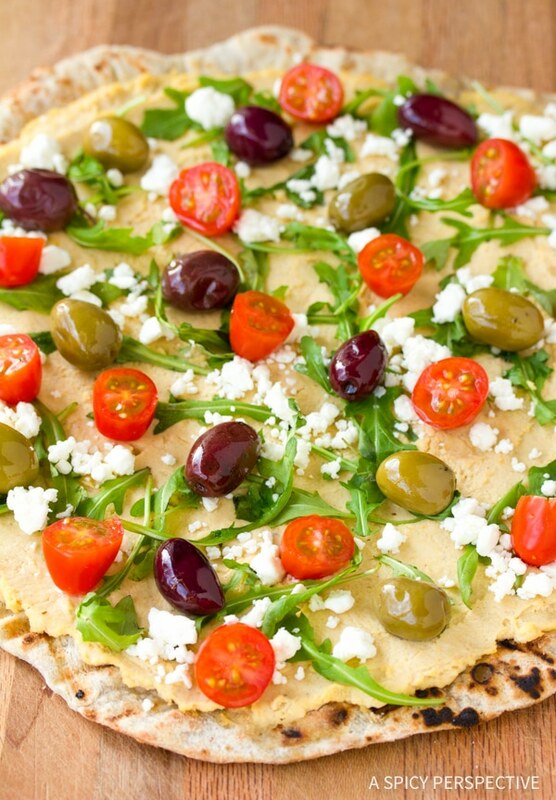 I love the idea of hummus on this pizza. I’m a sausage guy so it’s always on my pizza, grilled or not. Tomatoes, basil and mozzarella- simple but delicious! I pinned your pin on Pinterest. I subscribe to your rss and like you on facebook, and follow you on Twitter and Pinterest. I like feta and red bell peppers and garlic, oregano and olive oil. I follow ASP via RSS. In addition to your pizza, Kathy’s prosciutto and caramelized onions sounds delish! That sounds delish! I’d love to win! And I pinned Greek Pizza to my Yummy Eats board!!! My Pinterest name is Sue Melickian Moody!!! I love the baking stones for oven use with pizzas……the grilling concept is only going to make taste for gilled pizza that much better. As far as my first grilled pizza….the Greek for sure. I love grilled peaches, crushed olive tampanade, sundried tomatoes, olive oil glaze, minced and cooked pancetta, and arugula tossed in balsamic after removing from the grill. Goat cheese, arugula tossed with olive oil and white balsamIc vinegar and some prosciutto. Dang…I want some right now! I follow A Spicy Perspective by Pinterst. 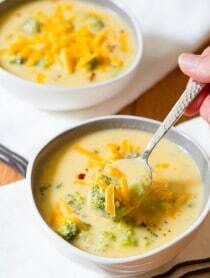 I follow BigKitchen.com on Twitter. I would love to use it in the oven for baking breads. Pesto, fresh tomatoes, salt, pepper and olive oil! Another with hummus, leftover grilled chicken, feta, olive oil, salt and pepper. Lunch tomorrow! I follow A Spicy Perspective’s RSS feed. I love blue cheese, fig jam, cherry tomatoes, and arugula on my grilled pizzas! Spicy Shrimp and or Clams with an Olive oil butter sauce and asiago cheesse. I would put sausage and jalapenos on it. I follow you by email – I like to grill my pizza dough and then top it with Hazelnut spread, strawberries and bananas. I would keep my topping very simple – a little tomato sauce lots of sweet red peppers and mozzarella (plus herbs) yum! I would put fresh tomatoes and spinach on my pizza. Maybe some meat if I had some already cooked. Follow A Spicy Perspective on Twitter. Cut up leftover meat w/ sautted peppers,onions mushrooms and jalapenos. Fresh mozzerella and a drizzle of good olive oil and fresh basil completes the pizza. Follow A Spicy Perspective on Facebook. Follow A Spicy Perspective via RSS. Follow A Spicy Perspective by email. Following BigKitchen.com on Facebook and Twitter. I like lots of veggies on my pizza…peppers, onions, olives, tomatoes! I also like bbq chicken pizza with bacon and red onion. One more for good measure: I follow you via Facebook too. The pizza looks amazing! I love Greek pizza! I have to try your dough recipe!! I love putting fresh spinach, sliced tomatoes and fresh basil with some mozzarella cheese on my pizza. Margerita pizza – olive oil, garlic, tomatoes & fresh mozzarella! i will pretty much eat anything on pizza :) yum! I like big kitchen on fbook! I like u on fbook! Lots of veges — your pizza looks great!! This pizza is awesome. Perfect flavors and toppings. We have been grilling pizza a lot and I usually choose either loads of fresh veggies or tomato/basil/mozzarella. Love it any way though! I like grilled veggies and pesto on my pizza! Yummy looking…especially love olives. I love spinach and mushroom on pizza. 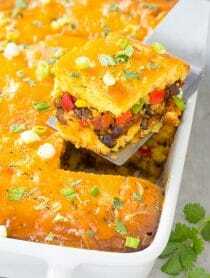 Add in some garlic and goat cheese and you can’t go wrong! We love pizza at our house. Favorite toppings include tomatoes, onions, olives and any other veggie we can find! Canadian bacon & pineapple! Yummy. Such a beautiful pizza and amazing photos, I want to dive into this! This looks amazing girl! Pinned and tweeted it! This pizza looks amazing, Sommer. Love the hummus! Its so fun and exciting to follow you on fb ! already subscribe to your posts! I love that grill pan!! So cool! I love all kinds of fresh veggies on my pizza, but especially one topped with arugula, that’s been my favorite lately…salad pizza! First of all… damn you for making me hungry for pizza at 11AM. :-/ I could devour that whole thing. Ok, next… that pizza stone would be used SO much here. We’re big time grillers and this is just what we need to start doing more pizzas. I love fresh mozzarella on my grilled pizza. Add some tomato sauce and arugula too! i can honestly say i’ve never had grilled pizza, but i feel that changing very quickly! i’m thinking some sort of chicken sausage and peaches…yum! My grilled pizza would have to have, some sort of red sauce, a nice italian sausage (spicy), red pepper, bella mushrooms, arugula and similar to yourself crumpled feta and drizzle of olive oil! I did pin it on Pinterest! Creamed Spinach Pizza and Hummus/Veggie Pizza are two homemade favs! I’m a huge fan of the bianca pizza – I especially love to saute some spinach with a little bit of garlic then top it with shredded mozzarella and fresh mozzarella! So delicious!! Another combo is just a pesto base and then shredded mozzarella, fresh mozzarella and some fontina cheese! pineapple. my absolute favorite pizza topping ever! Kasseri cheese, sliced tomatoes, fresh basil and balsamic syrup. Mmmm…this pizza looks heavenly! Lately I am obsessed with caprese pizza. So fresh and delicious! I love peaches, fresh mozz and balsamic! 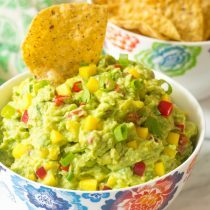 What a wonderful healthy alternative to greasy, limpy pizza! I want two pizzaas – one with salmon and the other with everything on it. I can never make up my mind when it comes to pizza. Or maybe a Caprese Pizza. Oh, what a great giveaway! I love to put thin pear slices with a little prosciutto or bacon, some goat cheese and then top with arugula when it done grilling. Your grilled pizza looks yummy! I subscribe to A Spicy Perspective in my reader. My friends always laugh at me because I like EVERYTHING on my pizza, grilled or otherwise. They say I like to “drag it through the garden.”.